The 3rd edition of our ‘Hiking Acadia National Park’ is available on Amazon.com, or directly from us. The book, published by Falcon and co-authored by us, has also been submitted for consideration for the Acadia Bicentennial Time Capsule. The time capsule dedication, on Dec. 10, is an official Acadia Centennial event. The awards program, in its 20th year, is sponsored by the non-profit National Outdoor Book Awards Foundation, Association of Outdoor Recreation and Education, and Idaho State University. 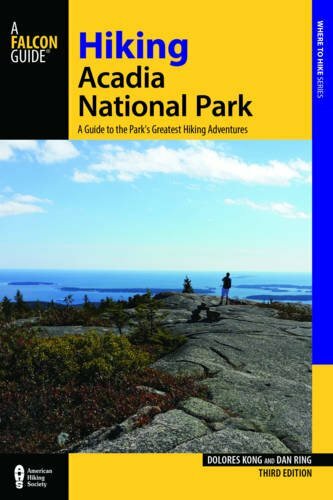 ‘Hiking Acadia National Park’ won in the outdoor adventure guidebook category of the National Outdoor Book Awards. The National Outdoor Book Awards recognizes books in such categories as outdoor adventure guidebooks (the category that “Hiking Acadia” won for 2016); classic (the category that a republication of “Walden” won for 2004); and works of significance (the category that the “AMC White Mountain Guide” won for 2003). Autographed copies help raise funds for Acadia. Or if you want to buy a copy for yourself or as a gift, the book is also available for purchase from Amazon.com (see sidebar for links) and other booksellers. You can also buy an autographed and personally inscribed copy directly from us, as an official Acadia Centennial product, with at least 5 percent of gross proceeds being donated by us to help support the park.